Asia is a continent of demographic extremes. At one end of the spectrum, there are three economies that are among the top in terms of life expectancy worldwide: Japan, Singapore, and South Korea. In these countries, declining fertility rate also means the share of the population that’s of working age is decreasing. 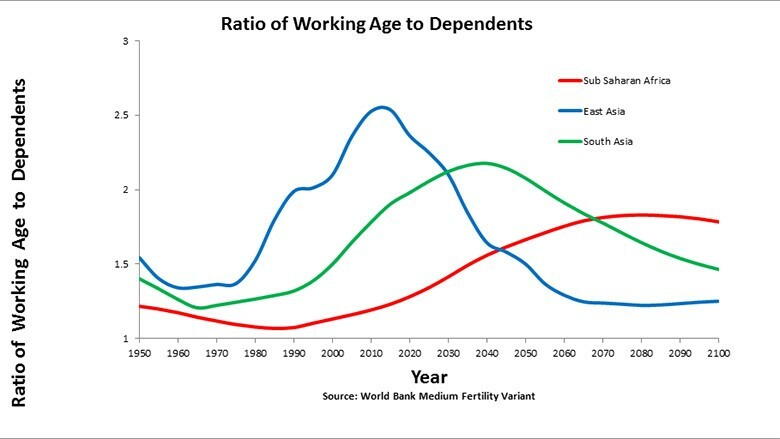 On the other side, there are countries like India and Indonesia where the workforce is still expanding, but with declining fertility rates, there is a potential demographic dividend inherent in a favorable ratio of workers to dependents. And there is the Philippines, where the fertility rate is still high and with the workforce supporting a growing population at both ends of the age spectrum, any demographic dividend remains elusive. East Asia has been on a path of a declining ratio of working age to dependents, while in South Asia, it is still the opposite. For comparison, sub-Saharan Africa is also starting to see a small demographic dividend (see Figure 1). Clearly, policy responses to demographic opportunities and challenges vary according to diverse situations. Notwithstanding the vast regional and country differences, there seem to be two sets of actions that could be favorable across the board. A combination of more open immigration policies and efforts to raise labor productivity can provide win-win opportunities. For countries like Japan and Singapore with shrinking workforces, expanding managed immigration, albeit their differences in immigration policies, can offer high returns. The influx of young workers can also ease strained pension systems and the burden of caring for the elderly. In the U.S., over a third of the immigrants are skilled and meeting the country’s economic needs. And it was immigrants who founded Google, Intel, PayPal, eBay, and Yahoo, companies that have created thousands of jobs. The economic gains from tackling declining working-age populations with more open immigration policies would also contribute to meeting the fiscal cost of supporting aging populations. Asia has far fewer formal channels of income support than the West, and the main source continues to be private savings rather than public pension programs. Asian countries need to expand the coverage and benefits of social protection systems, particularly public pension programs. The coverage and benefits of pensions are inadequate, especially for the elderly poor, and often unsustainable and in need of reform as for example in China and Thailand. Immigration is not a one-way street. In 2017, the remittances of overseas workers to developing countries are projected to rebound to $450 billion, according to the World Bank. That projection includes $239.6 billion for Asia, comprising $128 billion for East Asia and $111.6 billion for South Asia. Rebounding capital to the Philippines continues to remain resilient, projected at $32.8 billion, despite the political uncertainties in the Middle East. Second, productivity improvements are a must. A 1 percent fall in the supply of labor is often estimated to result in a similar reduction in percentage points of gross domestic product. High-income countries are especially vulnerable to shrinkages in working-age populations, because their pace of growth tends to be slower than emerging economies. These countries can accelerate growth through the technological and policy reforms that have already been used by developed economies. Mechanization and use of robots might provide partial solutions in selected industries, but they are by no means a panacea. On the other side, actions that raise the productivity of the labor force would accrue high payoffs. High-income countries can aim to raise the productivity of a working age population resulting from both lower fertility and greater immigration. Countries like Bangladesh, India, and the Philippines might continue to allow fertility rates to fall while getting the most productivity from a growing workforce. Even where populations have been aging, productivity growth—that is, getting more value from investments—has been weakening in Asia over the years. Countries that have managed higher productivity growth, notably South Korea, have improved the quality of spending on education and health. Asia needs to tackle the implications for economic growth and well-being of its demographic transition. More open but well-managed immigration on the one side and actions to raise productivity of the labor force on the other are twin steps with salutary effects across the board.